The instructions that follow for making a custom fitted baby doll sleeper can be adjusted to fit most baby dolls with moveable arms. The sleeper is removable, and can be made from knit or woven fabric. If you make the sleeper without legs, you can adjust the skirt to make a bunting bag instead of a sleeper. The sleeper shown in 1:12 scale is less than 2 inches long, and is made from fine inexpensive knit fabric. Sleepers for larger baby dolls can be made using heavier knits. Another good source of fine knitted fabric for miniature doll clothing is standard baby clothing or baby tights. Fine Knit or Woven Fabric - with a print suitable to your doll size. You will need a piece roughly 2 1/2 times as wide as your doll and a bit longer than your doll is tall. If you want your sleeper to be removable, knits are preferable to woven fabrics. Fine stretch knits are easiest to fit to a doll. 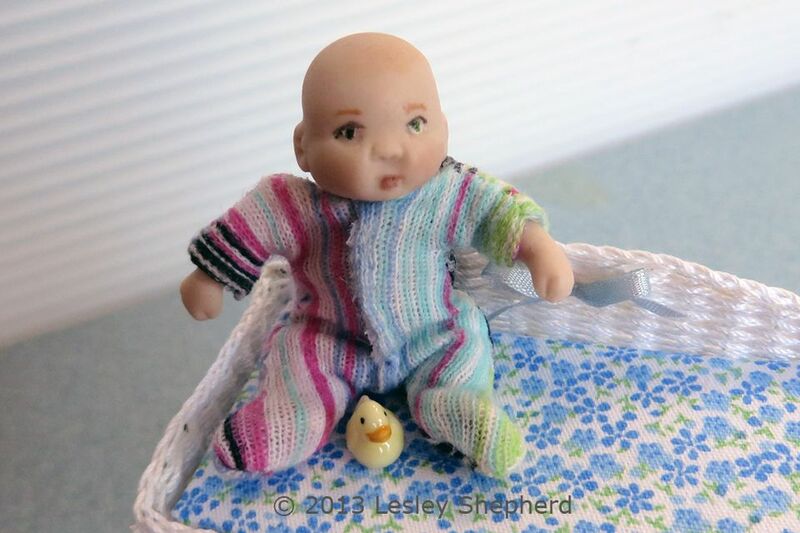 Custom Baby Doll Sloper Pattern - This is easy to make from the linked instructions. Fray Check or PVA Fabric Glue. Hemostats or Bent Nose Tweezers for turning the sleepers once they are sewn. Doll Velcro or suitable sized fasteners for your size of doll. The fabric thickness and pattern for your custom doll sleeper should be chosen to suit the scale of your doll. For this dollhouse doll, which is less than 2 inches tall, I used inexpensive knit cotton underwear as a source of fabric. If you are searching for suitable patterns for smaller projects for dolls, carry a pattern viewfinder or a printable scale person with you when you search. Used baby clothing from a thrift store is also a good source of small scale lightweight knit fabrics suitable for many baby doll sizes. Most knits used for underwear and baby clothes are resistant to ravelling. The amount of fabric you need for your doll sleeper will be the size of your custom sloper, plus the leg and arm length added to the sloper, plus extra for seams. In general you will need two pieces of fabric roughly the same size as your doll plus a bit of extra width. (see photo). Make sure you cut your fabric so the knit stretches across the width of your doll, rather than the length, to make fitting the clothes onto the doll easier.
. If your doll does not have moveable arms, you may have to adjust the way you finish your sleeper in order to fit it onto the doll. You may need to add underarm fastenings or leg fastenings to your design. A bunting bag can be made instead of a sleeper using just the arms on the pattern, and not the legs. bunting bags can be made from knit or woven fabrics as they are an easier fit for most dolls. A "sloper" is a basic pattern without any seam allowances based on the measurements of your particular baby doll. Custom sloper patterns are easy to make following these fitting instructions for a baby doll sloper. To make the sleeper pattern, lay your folded custom sloper pattern (see photo) over a piece of paper and add sleeves out in a 't' shape from the ends of the armhole openings. Add extra length to the arms to make sure they will fit your doll once hems are added to the base of the sleeves. Draw the legs out from the basic sloper on a slight angle from the sloper by extending them in the direction of the leg holes. Add extra length to these as well, you can cut it off later. Make sure your neck seam has a bit of extra fabric added to allow you to hem the neck opening easily. Make two paper patterns, one for the front sleeper piece and one for the back. On most baby dolls the neck and crotch seams will be different, and the width of the torso may be different between the front and back. In the photo shown here I've shown you the final piece cut from the pattern along with the original sloper used to make a pattern. To cut the pieces for your custom sleeper, lay the pattern so the folded center front or back is laid on a fold of the fabric. Make sure you pay attention to grain lines or the direction of the knit stretch. Always work with the center fold running along the grain of the fabric. In my case the lines of the print match the fabric grain, but I needed to check that I could rely on this! The front of the sleeper I am making will have a folded closure. To allow for this, extra fabric is left on the center fold of the pattern front. This makes the front pattern piece wider than the back piece to allow for a front overlap. If you need to add closures to the underarm seams or the inner leg seams to fit the sleeper to your doll, add the necessary fabric in to your pattern. The front and back pattern pieces are shown laid with side edges matching the photo on this page so you can see the extra fabric that runs on the center fold of the sleeper front. For my tiny 1:12 scale sleeper I allowed an extra 1/8 inch (2mm) to 1/4 inch, depending on your fabric, and the type of closure you will use. For tiny miniature sleepers, velcro is the easiest closure to use. Fasteners and buttons are not easily available in a suitable scale to actually work. The first step in sewing your baby doll sleeper is to finish the neck edges. To do this, gently fold over the neck edge as shown, using your fingers to press it into place around the curve. Try to avoid stretching a knit fabric. Once the edge has been turned over, use a blind hemming stitch to hold the turned edge in place. Take tiny stitches using fine thread and a fine needle (I use a fine beading needle). Try to catch only the back of your knit fabric as you make the hemming stitches. You don't want stitches going through the front of the fabric where they will be seen. Take care not to pull the stitches too tight, you want a nice even hand sewn tension on your thread. If the thought of hand sewing is daunting, remember that hand stitching is the hallmark of couture clothing. It may take a bit of practise to get your stitches even and your tension correct, but the skills you learn here will stand you in good stead on any sewing project! When you finish hemming the neck edge, use a fine bead of fabric glue or fray check to stabilize the cut edge of the fabric. The next step in making the baby doll sleeper is to sew the front and back pieces together at the shoulders. Carefully match your pieces, making sure the front and back neck edges meet up. Use a pin to hold the pieces together if necessary, and stitch with small back stitches across the seam on the seam line, leaving your seam allowance free. For my tiny sleeper I am stitching 1/8 inch )2mm)from the edge of my pattern pieces as I left a 1/8 inch seam allowance. Make your stitches as small as possible. It also helps when sewing fine knits to use your thumbnail to mark the seam line and work your needle directly up and down at right angles to the fabric. Once you have finished the shoulder seam, finger press the seam open and apply fray check to the edges. For larger dolls you can use an iron to press the seams open. Hem the sleeves to length if you are sure how long they need to be. See the next step for instructions on measuring the arm length if necessary. After the shoulder seams are sewn, and before the side seams are finished is the easiest time to finish the sleeve hems. If you aren't sure how long your sleeves need to be, lay your doll on top of your sleeper as shown and hold the fabric up to the doll's arm, using a pencil to mark where the wrist lies on the sleeper pieces. Some dolls have bent arms which may require a bit of adjustment to fit. Make the sleeves a bit longer than you think you need. Babies always look better in clothes which have a bit of 'growing room'. Use the same blind hemming stitch as you used for the neck seam to sew the hems at the base of the arms. Adjust the sleeve hems to allow for a bit more fabric on the back piece of the arm, especially if the doll's arms are bent at the elbow. Also make sure you turn back around 2 times the length of your seam allowance to make the arm hems. The arms will see a lot of stretch as you fit them on the doll. Longer hems make it less likely that the sleeve hems will fray. Before sewing any more seams, test the fit of the neck and arms on your baby doll. Hopefully your doll's head will pass through the neck opening. If the neck is too tight, leave the test fit until after you sew the front pleat. For larger dolls with large heads, you may need to open the shoulder seam on one side and plan on fitting a bit of velcro to close the neck opening. Or you can open the neck at the front enough to fit over the doll's head. Check that the arms will not be too tight at the wrists once you sew the underarm seams. You may need to accommodate clenched fists on some baby dolls, or hands which are larger than expected. Also check that the shoulder seams lie on the join of the doll's arm to the body. If necessary, make minor adjustments before proceeding. To measure the length you need to sew for the underarm seam of the custom baby sleeper, lay your back sloper pattern over the back of the sleeper and use a pencil to mark a small dot on the wrong side of the fabric at the point where the base of the arm meets the side of the body. Start sewing the underarm seams at the hemmed end of the sleeve, and finish your sewing at the point you have marked (see photo). If you are using a woven fabric, make sure not to sew the under sleeve seam completely up to the join of the arm. You need extra fabric at this point to fit the doll's arms into the sleeves. The next step in assembling your baby doll sleeper is to sew the side seams from the underarm down to the base of the upper leg seam. Use small back stitches and keep your tension uniform. Remember that the front fabric piece is wider than the back piece, so match the edges of the fabric, don't worry about the extra in the middle of the front. When you have the side seams sewn, fold the back at the center and the front at the centre. Match the folds at the center of the crotch, folding the extra fabric on the front of the sleeper over to make a pleat as shown. Stitch through the pleat along the bottom edge to set it in place. Once the pleat is fixed in place, sew the inner leg seams from the crotch down to the base of each leg. With all the seams sewn except for the foot, lay your doll on top of the sleeper with the neck in the correct position and pull the sleeper legs up against the doll legs. Use a fine pencil to mark the base of the doll's foot against the sleeper leg. Check the direction of your doll's foot and angle your mark across the sleeper leg if necessary to fit the angle of your doll foot. To finish the main sewing of the baby doll sleeper, sew across the base of the legs matching the lines you drew for your doll feet. Make sure you avoid making a tight point at the toe end of the foot, angle your stitching up from the bottom seam to make a slight boxed end at the tip of the foot. Trim the base of the legs and feet to match your seam allowance on the rest of your sleeper. Use fray check to seal the fabric edges if it doesn't make your fabric too stiff. With all the seams sewn and trimmed it is time to turn your baby doll sleeper right side out. If you are working on miniature doll clothes, use hemostats or bent nose tweezers to carefully turn the sleeper right side out through the neck opening. Take care not to stretch the neck too much. Take care when turning the arms and legs to get the ends of the feet and the arm hems turned neatly. The sleeper should fit easily over the hands and feet, and should be slightly baggy across the front where the pleat lies. Fold the pleat across at the neck to check to see if the pleated front closure takes up any excess material. If the front fit is too large, you may need to adjust the crotch length, front pleat, or leg length on your sleeper. Don't despair if you need to make fitting adjustments. Check whether it was your sewing technique, your doll, or your pattern that caused the problem fit. Any adjustments you make will make it easier to make more complex clothing later using your custom sloper and patterns. If the front of your sleeper fits, flip your doll over and check the back fit. For the back fit make sure you bend the doll's arms and legs into a sitting or crawling position. This will check the stretch of the sleeper across the back of the doll. If there are fitting problems on the back, you will need to unpick the seams and adjust them. You may need to adjust the leg length or the foot position of your sleeper. To finish the closure on your baby doll sleeper you can add a strip of velcro tape, small buttons or snaps, depending on the size of your doll. For larger dolls, small zippers are also available. For the baby doll in 1:12 scale that I am using, I set a thin band of doll velcro along the inside of the pleat, and matched this with the hook section of the velcro on the opposite side of the pleat on the doll's front. As my doll's head fits through the neck opening, I didn't need to cut and hem the fabric between the two strips of velcro. If you want to be able to show your sleeper partially open (to show off a diaper perhaps?) you may want to cut the opening along the inner fold of the pleat and turn it to the inside, finishing the cut edge with hemming stitches. The edge against the pleat can be glued to the pleat or turned back in under the front fold, the velcro closure will cover the fabric edges. The velcro sewn to the front overlap is sewn through all layers in a straight line of fine running stitches. The running stitch will leave a fine line of stitching visible along the center front of the sleeper, which is in keeping with most sleeper closures in full size. Have fun! This is a good way to start making baby doll clothing as it is a fairly simple project. Use this experience to explore the use of a basic pattern, and test how different materials work with simple seam lines.